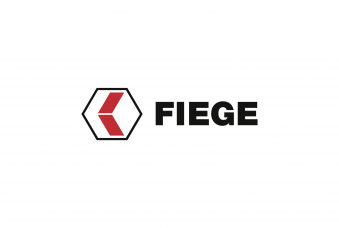 They tested the new e-bikes: Fiege's Jan Fiege (2.v.r. ), Kai Alfermann (l.) and Marc Borgmann (r.). 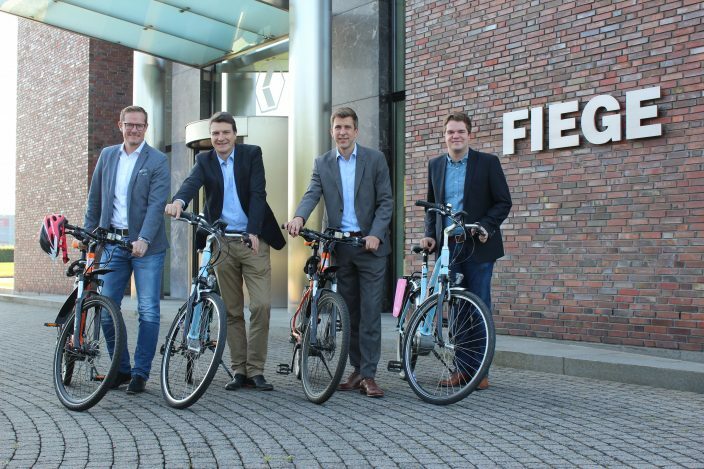 Ulrich von der Benken from Innogy handed out two e-bikes. Ulrich von den Benken (r.) von der Firma Innogy zeigt Jan Fiege die Funktionsweise der Elektro-Fahrräder. Die vier Pedelecs dürfen Fiege-Mitarbeiter nun nutzen - für den Weg zur Arbeit, die Mittagspause oder auch in der Freizeit über das Wochenende. Die Fahrräder können kostenlos ausgeliehen werden. Greven, 18th July 2017. The 130 staff at Fiege System Headquarters have the opportunity to experience electrical mobility live and direct for themselves. The company is piloting electrical bicycles which are available at its head office. The first e-bikes have been in use for some weeks now and have proven to be so popular that more bikes have been added to the fleet. 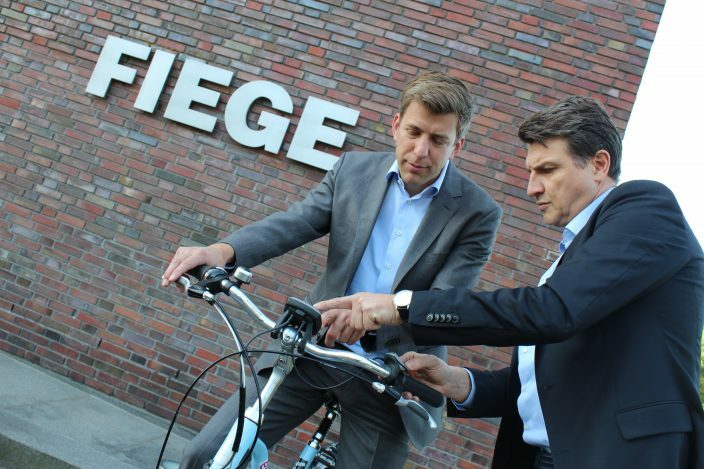 Fiege’s partner, Innogy, who aims to further electrical mobility within the region, supplied two more e-bikes last week. Whether during a lunch break or after work: With up to 80 kilometres of assisted cycling the bikes surprise not just with their wide reach, but also with their fun factor. “Our employees are to be given the opportunity to acquaint themselves with electrical mobility. 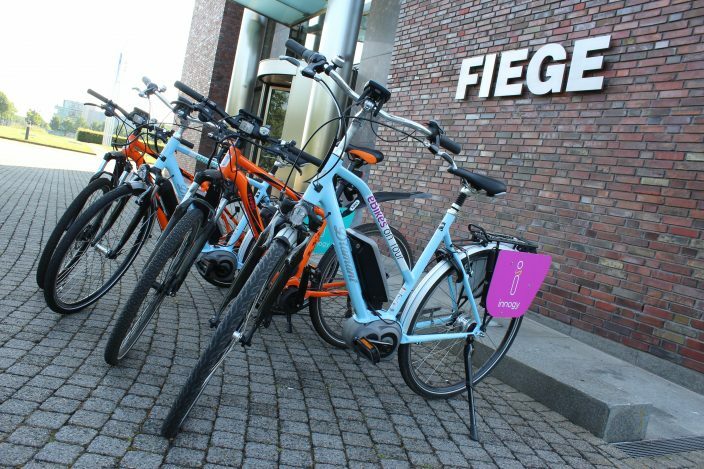 We will observe how the offer is accepted and possibly provide bikes at other locations, too”, says Kai Alfermann who is in charge of energy-related topics at Fiege. Official regulations prohibit these so-called pedelecs (Pedal Electric Cycles) from exceeding speeds of over 25 kilometres per hour. However, the overall goal is to act responsibly in traffic situations when cycling with an e-bike, says Ulrich von den Benken of innogy. A registration or even a license, however, is not required for such an e-bike.